Sporran is a gaelic scottish word meaning purse, it fastenes around the waist and is part of the male Scottish Highland dress. It performs the same function as pockets on the pocketless kilt. 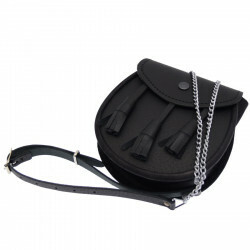 This sporran has a leather flap, a metal chain and three leather tassels.